Since OS X Public Beta, released ten years ago on September 13, 2000, Apple has launched seven major versions of Mac OS X. During that long evolution, Apple has changed many things about its operating system: Finder behavior, bundled applications, appearance, and more. The most recent release—2009’s Snow Leopard—packs features that would have made users of early OS X very jealous indeed. In honor of OS X’s tenth anniversary, let’s examine at some of the more notable differences between the public beta that debuted a decade ago and today’s version of OS X. Every version of Mac OS has sported a tiny Apple logo in the far left corner of the menu bar that runs across the top of the screen. In a curious design choice, Apple decided to shift this logo’s location to the center of the menu bar in OS X Public Beta. Mac fans hated the change, and they let Apple know. Apple put the tiny logo back in its rightful place in time for the inaugural OS X 10.0 release in March 2001. 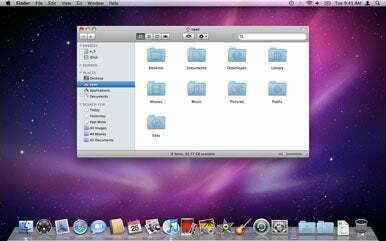 Mac OS X (including Public Beta) sported a white pinstripe theme with translucent-looking jelly bean buttons until Mac OS X Panther in 2003, when OS X Finder windows gained a brushed metal appearance. Mac OS X later began sporting a gray gradient window appearance in Leopard (2007), which persists in Snow Leopard today. OS X Public Beta included Sherlock, a much-hyped search tool that Apple had introduced as part of Mac OS 8.5 in 1997. In OS X’s Public Beta, Sherlock not only let users do advanced searches through their own files, but searches for Websites, people, products, news, and more. Apple quietly killed Sherlock in favor of Spotlight, a more powerful system-wide search feature that first shipped with Tiger. Spotlight remains a key feature of Snow Leopard today. The Finder in Mac OS X Public Beta was slow, rudimentary, and buggy—as was to be expected with beta software. While it supported icon view, list view, and column view, it lacked the left hand customizable list of icons called the “Sidebar” that Apple introduced in 10.3 Panther. It also lacked an integrated search box and the ability to show or hide the permanent location icons (home, favorites, apps, and so on) at will. Mac OS X Public Beta’s support for running pre-OS X Mac apps in the Classic Environment wasn’t perfect—users reported many bugs—but Apple included it anyway because it needed extensive testing from users. Apple finally killed support for Classic in Mac OS X 10.5 when Macs made the switch to Intel processors. In the Public Beta, Mail.app was present at a bristling young version 1.0. Surprisingly, it worked quite well. Old favorites Calculator, TextEdit, Stickies, Address Book, and Preview were all there from the beginning in their younger forms as well. Apple didn’t have iTunes ready for OS X yet—that would happen in 2001—so it included “Music Player,” a rudimentary CD and MP3-playing application, in its place. For a Web browser, OS X Public Beta included a very buggy “Microsoft Internet Explorer for Mac OS X Beta,” which resembled the later Internet Explorer v5 that shipped with OS X. Safari wouldn’t make the scene until 2003. Mac OS X’s only pack-in game, Chess, is worth noting because it first appeared in 1989 as part of NeXTSTEP, the direct ancestor OS that preceded OS X. From Mac OS X Public Beta to Mac OS X 10.2, Apple Chess used the NeXTSTEP version’s pseudo-3D graphics and a GNUChess engine for the backend. In Panther, Apple granted Chess a fully 3D graphical overhaul that can still be found in Snow Leopard today. Along the way, Chess.app also started using the Sjeng chess engine. One of the most notable features of Mac OS X added since the days of the Public Beta is Time Machine, a utility which allows continuous automated backup of user files to an external hard drive. OS X lacked this feature until OS X 10.5 came along in 2007, making running OS X back then somewhat riskier than it is today—especially in the Beta version which was prone to crashes. 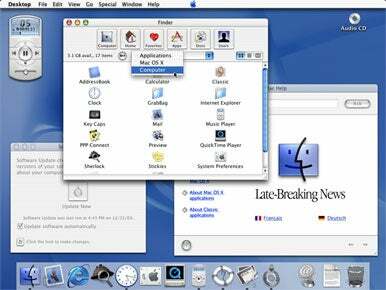 Another notable modern element of OS X missing in early versions of OS X was Dashboard. This pop-up feature of OS X that allows users to run small programs known as widgets was nowhere to be found in the Public Beta. In fact, it didn’t appear until OS X 10.4 in 2005. Before that time, third-party widget applications like Konfabulator filled the void. Mac users in the early 21st century who chose the OS X frontier over a life of OS 9 comfort had to rough it for a few years—Apple’s new OS represented a wild and untamed territory. But many of those who stuck with it eventually found rich rewards as they built the foundations of applications, services, and general improvements that we now enjoy in OS X today.